Nursery, Emu Ranch, Nail Salon, Video Poker, and Auto Body Repair. After a few weeks of arguing we decided to mark our new stuff with NEW! Well, we hadn't put out a new list in a while since Earl's been recovering from a chronic case of acid reflux along with a lingering toe fungus. The emus got out of their pen and ate the woody plants up so high we've had to wait for 'em to grow out. Meanwhile, Marie's been teaching nail painting in the back room of Uncle Fred's gas station to help make ends meet until we could get 'nother plant list ready. It's still been a decent year, 'specially since that tour group looking for Mildred's House of Wax and Flamingo repair got lost near the nursery. Many of 'em had never seen an outhouse. What are they teaching folks these days? Anyway, Earl's put a list together of thangs we hope to have ready for next season. As always, thanks for your business. Welcome to our new website. We've gotten the cobwebs worked out (hee hee). If you downloaded our 940K catalog from our old page we apologize for the Lucifer 7 Headcrasher virus some of you got as a bonus. Simply reformat your harddrive, reinstall all your software (twice if necessary), and everything should be fine. We appreciate all the orders and have cranked up the old prop frame and will ship stuff out the second they root. We're a bit new at grafting so a couple of product items might need to cure a bit before you plant them out. And thanks to our good friends at the Dept. of Agriculture, US Customs, the year-long quarantine, and a truckload of fumigant we are now mostly free of the nematodes and the rare Phyto-ebola virus this year. Marie also does psychic readings and cuticle reductions during the day so please be patient with us. This smooth-top maple appears to have a mysterious ability to heal sick plants around it. Although reportedly a hoax, it still has a huge following. This selection has been re-invented so many times, we've lost count. Reportedly, this selection does not run, but frankly, we don't trust that to be the case. We've found it to pop up when you least suspect it... very aggressive. This much improved selection over its predecessor still leans quite far to the left with the slightest breeze, but doesn't make quite as much noise when doing so. Very strong and well endowed selection, but will sag without proper support... An uncommon color for this genus. This selection is so over-the-top, it's obscene. Some years, this shapely selection becomes really large, then becomes small again the next year. This has proven to be an excellent selection for breeding although we are still trying to determine the other parent of our offspring. A real first of its kind! While we find this attractive, we've also found it to be quite aggressive and very detrimental to nearby bushes, so watch it closely. A superb choice for the West Coast. It's impossible to be impartial about this unique large-headed selection... either you love it or hate it. We propagated lots of these because of initial interest, but the more that people are around it, the less they like it. Now we can't give the damn things away. This Alabama endemic is one of the fastest and most aggressive groundcovers that we've grown. It even seems to perform well around old broken asphalt. Although most daleas have green leaves and yellow flowers, this selection has shiny black leaves and red flowers... always a crowd favorite. This new coneflower has the unique trait of opening after the sun goes down and closing before morning. We got all excited and ordered these before we realized that it's pretty worthless. We've planted a row out back where the dogs can enjoy 'em while they howl all night. Subject of debate over worthiness, but most people now subscribe to the theory that this is simply a very juvenile selection. Trials over a large section of the country indicate it's not a popular as once hoped. This small but tough selection with a large head is just what we've been looking for. The head starts off brown, but ages to a nice shade of grey. We still have this listed as E. dubium, but having watched it recently, we think it may be an independent species. This euphoria generates lots of excitement wherever it appears, but the euphoria tends to fade quickly when E. 'Chavez' doesn't live up to the marketing hype. We understand they can be ground up for cheap fuel if they don't sell. This popular new large-growing selection makes a loud and brash statement in the garden. We kept thinking it would fade away in our climate, but it indeed does have good staying power... We only wish it were a sterile selection. We thought we would get by without trying another gunnera, but heard this selection was tougher and more tolerant of adverse conditions. Although it's been wildly popular, we quickly filed this away in our album of been there, killed that. This new annual mophead hydrangea flowers like crazy for 4 weeks, then dies. We find this breeding advancement great for return sales. This is one of the strangest nuts that we have ever seen. The olive-green nuts hit the ground with explosive force and afterwards have a strong allelopathic effect starving anything nearby. This fast-growing magnolia is quite attractive while juvenile. We've tried tracking down older specimens to see how it will age, but have not had any success. This thin but very durable selection performs best when planted on steep hills... Seems to be strangely favored by crows, but we ran them off. We were sorry to see this selection be pulled from the market, but we've saved a few back for special customers. An engrossing upright grower that always seems to take an unexpected turn at the end. The world's first self-marketing rose! There's more blood red that we've ever seen in one place... smashing! As with all sabatias, this one grows best near water. The flowers are great for parties, but they tend to show off better with a little vodka in the vase. This popular selection seems to adopt well to a variety of conditions. Frankly, we find it a bit homely, but hey, it sells. A stately selection that tends to prosper around other bushes. Very popular, which is music to our ears. This is the most contorted, unusual selection that we've seen. The originators seem to have a greatly inflated view of plant value. We haven't sold any yet, but have been asked to keep the price high. This is the 20th new version of this popular perennial. The last one we sold would grow well, then stop growing, then start over again. We've been promised this is an improvement. Dark green but cheerful fir shrunk down to half size. Develops a thin crown with age. Compatible with Daphne 'Moon' (plain jane leaves). Great with Anacyclus depressus. Not for us. We're more the Abies religiosa type. But whatever makes your cones upright!?! A real dramatic best seller. The name means 'red faced flatulant monkey that dances among the golden maidens in the emperor's temple after sunset'. Variegated. Bright green leaves with a rich yellow-green network of veins and distinctly bronze tips to each lobe. Our own find. Sometimes reverts to the regular green species type. Each satiny lobe is soft and cup-shaped. Has in irresistible silky feel and sheen. Usually looks better in pictures and on TV than in real life but is delicate and better than the old look. Includes matching hose. And before you know it the spores will be flying! Very green. Otherwise indistinct. Under controling legal authority (patented). To be discontinued after 1999. Recently discovered outside a Buddhist temple. Closed related to Clintonia but more green and less invasive. We got this one from Texas but no one seems to know much about it. Not entirely sure if it's like the parent species. Seems to have a shallow root system so far. We're not sure about it's hardiness but it hasn't performed well in New Hampshire. Useful for compromising positions. Not always found true. A trailer from Arkansas. It has slightly frizzy golden flowers with a number of distinguishing characteristics. We offer the improved clone with the 'short spur'. Best with a thoroughly organic deposition. A rigid old Southern native. Some folks like it, others don't. Rather conservative look. Not very charismatic - no tongues here. Not always cultivated. Collected near Lynchburg VA. Might just be a common subspecies of Arisaema puritanica. Stunning, tall, very elegant, ornate specimen. Lovely, fully rounded jug-like blooms. Long reddish hairs. We found this on our recent tour and got a tiny shipment. Thanks to our fearless crew it's no longer lost. Sure to be the star in any location. A loudly riotous and controversial selectoin... very prone to sleaze late in the season. Rich golden color. Best in cold climates. Self-heading. Will trail and hangover with maturity. Bred by the Univ. of Milwaukee. Thick textured glowing pink and lots of cream streaking on an eager pale pink throat. You also have your big hose-in-hose effect if you get the two meanings of them words. Just like the one's in everyone else's driveway but now you can say you paid more and have a special kind imported from England! Companion plant for Juniperus horizontalis 'Prince of Wales'. Very hard to explain appeal. Has a most unique aroma for this genus. 15 feet high including showy buds. Developed with funding from a Joint Session of Congress. Recommended by 9 out of 10 Rhodes Scholars. Upright, dense, and becomes coarse over the years. Almost everything is pure white. Intolerant of most conditions. Ours is the less formal Reformed Strain. Originally from the Nixon breeding program. Likes interplanting with red-banded grasses with German names but rejects the existence of mass plantings. Goes dormant and survives colder winters. Two for one with 'Slick Willie'. Juvenile form but becomes large over time. Upright with long sprays. The perfect designer plant that suits us just fine. Likes chalk. Numerous conspicuous pistils. A commanding old favorite of the highest caliber. Great for breeding purposes as reproductive organs are often exposed. A hard to find gem. A cherry red hybrid of 'Lustgarten Weeping' and 'Heart Throb'. Billions and billions of star-like flowers on long telescoping stems. Good with Euonymus fortunei 'ET'. Our own introduction which is unique and quite unlike any other conifer. In spring it resembles your basic grey form but slowly develops abundant amber-yellow ornaments on each branch - just in time for Christmas! Always moves to the left of where it is planted. Chartreuse with a mask of darker green. If you can believe it, it looks like it comes from the moon. Used to be under our 'Lauren' Holly but not happy there anymore. Reportedly a new favorite at the White House gardens and the South Park Arboretum - Good job you bastards! They've killed Kenny! A key specimen for the edible garden....never overlook the gums. Males tend to be stiffly upright while the females show spreading limbs. Our own sport of 'Tschi-Tschi', larger in all parts. If you want things seedless, thornless, classless, and clueless. A robust and perky performer. A robust selection from Austria. Difficult to terminate. Crude and ugly but popular beyond all accountability. An instant favorite in our garden. Upright sport of 'Magic Wand'. What happened when Stella ran into the D'Oro. A popular choice found throughout New Jersey. A long-time favorite we happen to have plenty of. A historic hybrid from the garden of the our first president. Bright powder blue perfoliate leaves with glossy accents and uneven notched margins. Green leaves are folded down the middle with narrow white lines in the center. Powdery surface. The ideal Hosta for stimulation in the urban environment. You just might be knocked out. And there are big blades everywhere. A snowy show for a real wild 'scape. This old favorite is nothing to sniff at. Tissue cultured so we can offer you a new lower price. Intolerant of exposure. Develops a big top over time. Ilex x meserveae 'Blue Baby' $12.95 Can be short lived. Proven pollinator for Holly (and Lily, Violet, Iris...) but that's a private matter. Well, technically its not pollination. It's more like Normal Privileged Informal Reproductive-Type Conduct. And since it's airborne and no stigmas were directly fondled... Subject to recall by our secretary. Because you're not really buying it or having a relationship with us you have no recollection of this listing, right? Nice with Azalea 'Impeaches and Cream'. While most of the offspring are pure white this one has a delightful dark shade. Not everyone accepts the genetic affinity here but as they say "they're all pink inside." Recently celebrated at the Monticello Gardens. Add a little life, liberty, and pursuit of ebony happiness to your garden. Equally as lovely as the species but we suppose that is self evident. 100 yard rolls available Installation not included. 10 year warranty. Brought to you by Longwood Gardens and Dupont Chemical. Juniper blight and pet stain resistant. Twisted, mottled, and most of all petite among it's distinguishing characteristics. Found at a Little Rock hotel but reportedly seen in hundreds of other places too. Cannot send to Chapaqua, New York. Indian red (whatever that is?). We have no reservations about this one! Nice exfoliating bark but stop when you hit green. What's up with that? Lily white. A favorite at 1600 Pennsylvania Avenue when foreign policy wilts. Can replace Amelanchier albrightii 'Madeline'. Bright pink with darker veins arising below a thick bud. Upfacing. Narrow leaf and everything else. Best if kept away from red or pink flowers or anything with a name like sibirica or kamtschaticum. Spreads quickly. Likes moist places. Forms clumps. Our naturist neighbors the Duffers shared this with us. A new clone with basketball sized fruit! Great fun for the entire family. Buds open pure white and latter develop tinges of red. A rare hybrid of every known cultivar. The foliage is richly banded in golden with bright white longitudinal stripes and glowing red autumn color but it's so narrow and short you cannot possible see anything. The verdict is still out on this new selection... thousands of pages of data yet to be reviewed. For unplanting near Ilex verticillata 'Bill J. Clinton' but can become invasive over the years according to some reports. Mellow off-white color that is quite addicting. Phlox paniculata 'Dodo Steve Forbes' Out. Available Fall 2000? Lovely magenta rose flowers. Leaves downy white by midsummer. An interesting seedling we found one day while walking the emus. Wide-spreading, showing lots of pink color even when young. An appealing tight little mound. Banned in several states. or no money down and 8.2% of the principle due monthly for 221 months with an APR of 35.6% pro-rated by spousal peroxide index and number of hunting dogs. Twist and bend it any way and it stays! With blood red flowers and leathery leaves its bound to please. Best if tied and pinched occasionally. Probably isn't a virginiana. Not sure if this is the correct name. Forms a tiny tree similar to Prunus persica 'Bonanza'. Not bothered by Round Up. Very well adapted to prairie conditions. Nice for a sudden splash of color. The official tree of the Million Youth March. Huge double flowers about as natural looking as Al Sharpton's hair. A absolutely unique breakthrough in breeding with a narrowly erect central stalk, massive creamy sprays, and drooping red clusters. It's hard to beat! Similar to 'Bradford' but rocket shaped. Developed by the National Abortetum and DARPA (Defense Agency Redundant Pear Authority) inorder to justify a budget. Salt II tolerant. Resistant to fireblight, scabs, slimemold, and Congress. Add $12.2 million for Y2K compliability. Hairy, aromatic, fleshy, and dusty rose. Who could ask for more? Can become leggy unless well fed. An unusual red but worth the gamble. Takes the occasional pinch. Pint-sized but potent favorite. Good for naturlizing in parks or curbside. From the Texas panhandle. Self-pollinating. Not widely seen these days. New ever-changing bisexual hybrid. First its golden yellow then its copper brown then its platinum blonde! Sensational and a big seller but in our opinion overhyped. A wonderful distinct selection we found along a roadside that actually has big golden fluffy plumes in fall (unlike all other goldenrods we know), green foliage, and some drought tolerance. We're not sure what species it is (or how many years before it overruns your garden) and so it makes an ideal rare cultivar every collector must pay up to own. Order quick before we give it a cute name applicable to every Solidago ever seen, call it an "essential native plant", and triple the price. Lean clump with redhot bunlength flowers. Cheap filler plant. No turkey here. From Mobile. Over the years forms a bloated, impenetratable mass. Dislikes pruning. Probably a media product. I know we said no new Taxus but then again the middle class tax cut didn't happen either. Let's just blame it all on El Nino and some kind of vast conspiracy deal. Very large selection with heavily ribbed, rubbery leaves with a prolonged tip.... very natural feeling. Will not multiple or transmite viruses if handled correctly. Good for KY. The best way to wake Robin. Good companion plant for Ipomoea batatas 'Margarittaville'. Rich blue flowers. Another German miracle plant. Yes, Really! Good golly we've found the illusive black pansy! Has a slight tutti fruiti scent. Adds a bit of wooooooooo to your garden. This is our own accidental cross with a red pair of socks. Color stays bright even after 50 rainstorms. including a 60 day supply of Viagra Keeps your clump woody yet succulent. Looks harmless but can stab you when you least expect it. Almost all parts are finely speckled in red. Usually encountered on golf courses. Try it out.... and if it doesn't fit we'll remit. Our Trial Winner of the Century. The Complete Hosta Book 13 pages. Flora of Bosnia 1 page. Success with Petunias 319 pages. Heal Your Own Damn Self with Herbs from the HMO Assoc. of America. Visiting Instructions: First of all, please phone ahead (555-6969). Click here for the reason why. He's our nursery security director and we haven't lost a rare plant yet. Follow Highway 451 north out of Loutsville until you reach the twelveth exit after Cretin's Hollow - they are not numbered so count carefully. Follow the exit and take three lefts then a VERY quick, sharp right before the rocks tear out your transmission. Follow the dirt (mud) road six miles until you see these guys*. Turn at the white quarantine sign and drive down into the valley unless you see a "road out" sign. Once you get to the Boxelder Glade follow the next three rights until you see our new prop house. There's a narrow, little bridge from the road out back. Earl made it himself out of some extra boards so please drive slowly. If you have one of those fat SUV monstrosities with it's own zip code please park and walk the last mile. 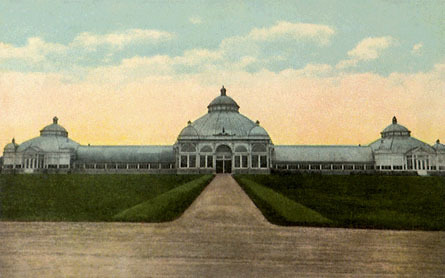 To the right you'll see a group of vigorous shrubs and vines with shiny leaves. That's the Toxicodendron Collection and what used to be our Dwarf Conifer Garden. If you see anything left you want let us know and we'll send Cliff down to dig it for you. (There's a couple of rare 10 foot Chamaecyparis in there somewhere if you can find them). Next you'll see an iron gate with a security console. Punch in 6969 and you'll get in. WARNING: the iron gate closes automatically and quickly. Drive on QUICKLY or you'll get a shorter wheelbase. If you don't see the prop house you probably missed a turn and ended up at Earl's vintage outhouse collection. We give tours of it too if you're so inclined - for touring that is. Once you're already that way follow the high road to the left, drive 3.2 miles along the cliff face, and turn into Duffer's Farm**. Their dogs are meaner than Satan so stay in your car, honk, and sooner or later someone will direct you into our nursery the back way. (The Duffer's sell a generous, hearty tripe and gizzard meat pie if you're hungry. And ABSOLUTELY NO ONE makes a better grade of homemade soft, runny blue cheese). Put your vehicle in low gear and enjoy the cruise down the hill past our second Emu Paddock. Your nose will tell you that you're there. Turn left at the bottom of the hill past the combination old car junkyard and Clematis Collection. When you get to our mailbox honk a few times and someone will make sure all the scary beasties are confined. It's okay to pet the brown dog but not the tan one. 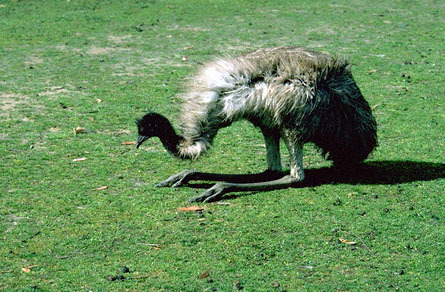 * PLEASE DO NOT PET THE EMUS. They are mighty ornary when their babies are running about and that's most of the year. Their species and the Ostrich are about as close as we get to having real dinosaurs around today. They're also three times stronger than humans pound for pound. (And twice as flavorful). Their beaks can bend fence wire. Remember that. As good as our nail salon is we might not be able to fix your digits if you go to petting them. Emus also tend to be what we might call eager multipliers. "Thumper" and "Earl Jr" (our little family joke) can be aggressive guys sometimes and may try to mount everything in sight. (For some unknown reason Earl Jr. has a thing for compact Japanese cars). If you or your family are likely to offended by such bold, passionate displays please stay home. This is a real farm and nursery (we're not kidding) and such things are natural and just happen. These tall, fuzzy lads seldom take no for an answer and have not heard of political or anatomical correctness. "Thumper" is a tad inbred and mostly blind but is a very forceful, drooling, amorous old guy - so this is another reason for not approaching them! Don't come complaining to us if something messy or painful happens. You've been warned. ** Our good neighbors are what they like to call naturists. In plain terms that means they run a clothing optional farm and dairy. And we're not talking about the cows here! John and Clara Duffer have been running their family operation since 1927 and helped get us started. If this sort of thing offends you be sure you don't get lost and take the regular way in. Is true to one name or another. Was living at one time. Is free of visible diseases. Has no flying pests and weeds. Has the potential for or beginnings of a real root system. In case you haven't noticed this page is a parody. It was composed and revised by several people - most of whom were severely crapulent at the time. Any offensive or insulting remarks are purely intentional. This web site was tested on captive chimps and stray kittens. However, it has been certified and approved by PETA (People Eating Tasty Animals) whose motto is "If you really love animals....order a TRIPLE cheeseburger."